By the start of the 20th Century, six major cholera "pandemics" had affected countries across the world. The world is now fighting the seventh, caused by a new strain of the Vibrio cholerae bacterium. Epidemics involving this strain started in 1961 in Indonesia, spreading rapidly elsewhere in eastern Asia, and from there to India and Bangladesh, the USSR, Iran and Iraq. Only 35 cases of cholera were reported in Europe in 2000 and only 9 in North America. The bacterium is part of the flora of brackish water and estuaries - it is when this water gets into the drinking supply that an outbreak can start. It causes severe diarrhoea and vomiting, and patients, particularly children and the elderly, are vulnerable to dangerous dehydration as a result. 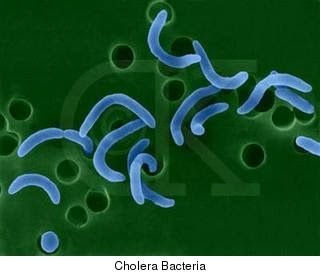 An outbreak of cholera can spread quickly in areas where there is poor sanitation and where water supplies can be tainted. Most people infected with cholera don't actually get ill. Despite this, they are contributing to the problem because the bacteria remain in their faeces for up to a fortnight. It is only rarely spread by person-to-person contact. Most symptomatic cases are hard to distinguish from other illnesses that cause diarrhoea - it is only in one in 10 that severe symptoms such as dehydration occur. A well-organised response to cholera, says the World Health Organization, can reduce death rates to 1 per cent. An unprepared community, however, will experience many times this death rate, it says. Treating the condition - or rather alleviating these severe effects, requires only simple measures. Normally, rehydration salts are the only treatment given, although severely dehydrated patients may need intravenous fluids. However, the clean water and rehydration salts required are often in short supply in areas where they are needed most. Antibiotics can reduce the amount of diarrhoea. There are two oral cholera vaccines - but these are mainly aimed at travellers rather than wider use in a community stricken by the illness. Control of an epidemic is difficult in a community unless clean water supplies can be restored. Systems for hygienic disposal of human wastes also need to be brought in. Cooking practices need to be made as safe as possible - where practicable, food needs to be cooked thoroughly and eaten while hot, and raw fruit and vegetables avoided unless they are peeled first. Hand washing after going to the toilet is a vital measure to prevent the spread of the disease.